Stand Up To Cancer (SU2C) funds research to develop the newest and most promising cancer treatments to help patients today. A division of EIF, SU2C dramatically accelerates the rate of new discoveries by connecting top scientists in unprecedented collaborations to create breakthroughs. SU2C innovations lead to better cancer prevention, diagnosis, and treatment, which means that we can help more people diagnosed with cancer become long-term survivors. Stand Up To Cancer (SU2C) raises funds to accelerate the pace of research to get new therapies to patients quickly and save lives now. SU2C was established in 2008 by nine women in the entertainment and news industries who utilize assets of the media and entertainment community to engage the public in supporting groundbreaking translational cancer research, and to increase awareness about cancer prevention as well as progress being made in the fight against the disease. SU2C’s first unprecedented television fundraising event aired simultaneously on the ABC, CBS and NBC networks in September 2008. An array of stars from film, TV, sports and journalism urged viewers to “Stand Up” and join the fight against cancer in memory of those we have lost to the disease, and in solidarity with those living with it. SU2C has produced five subsequent “roadblock” telecasts, in 2010, 2012, 2014, 2016 and 2018. The most recent telecast was carried on more than 70 broadcast and cable networks, and streaming and social platforms in the U.S. and Canada. 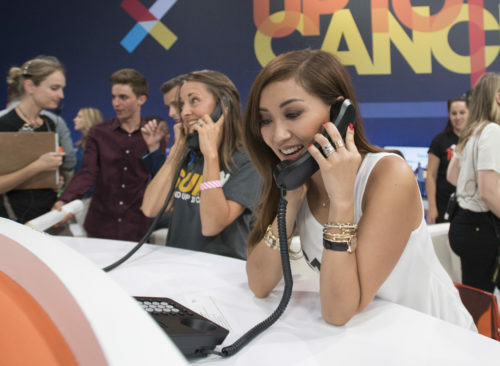 Well over 800 actors, musicians, athletes, and public figures have volunteered their time in support of SU2C in these telecasts and in other awareness and social media activities. Actors and musicians have included Mahershala Ali, Jason Bateman, Kathy Bates, Beth Behrs, Julie Bowen, Josh Brolin, James Corden, Katie Couric, Kaley Cuoco, Matt Damon, Shannen Doherty, Julia Louis-Dreyfus, Jesse Tyler Ferguson, Jennifer Garner, Max Greenfield, Tony Hale, Jon Hamm, Mark Harmon, Marg Helgenberger, Ed Helms, Sarah Hyland, Ken Jeong, Adam Klein, Tyler Labine, Diego Luna, Sonequa Martin-Green, Marlee Matlin, Matthew McConaughey, Eric McCormack, Maria Menounos, Jillian Michaels, Tracy Morgan, Trevor Noah, John Oliver, Dave Price, Dak Prescott, Keanu Reeves, Italia Ricci, Rob Riggle, Tracee Ellis Ross, Winona Ryder, Karla Souza, David Spade, Eric Stonestreet, Alison Sweeney, Bree Turner, Keith Urban, Sofia Vergara, and Marlon Wayans, and more. SU2C’s “signature” Dream Teams of scientists and doctors, from different disciplines and institutions, work together in synergistic and innovative groups. In addition, SU2C has forged new collaborations through its Convergence program, where clinical researchers work together with engineers and physicists. SU2C Catalyst® projects bring together academic researchers, funding, and compounds supplied by supporting pharmaceutical and diagnostic companies with active SU2C management to accelerate cutting-edge clinical trials, often involving novel combinations of compounds. SU2C has formalized collaborations in Cancer Interception, which involves finding ways to actively intervene in the formation of cancers, rather than waiting to treat fully developed malignancies. The Scientific Advisory Committee (SAC), a “blue ribbon panel,” provides guidance in developing the SU2C research portfolio. Chaired by Nobel laureate Phillip A. Sharp, Ph.D., Institute professor at the Massachusetts Institute of Technology and the Koch Institute for Integrative Cancer Research at MIT, the SAC involves approximately 25 other highly accomplished senior researchers and physician-scientists, as well as representatives of several national advocacy organizations. 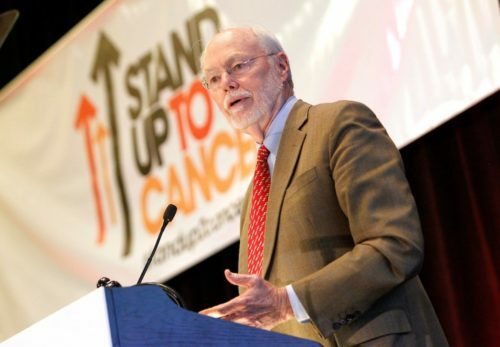 Working with its Joint Scientific subcommittees, the SAC has awarded grants to a total of 91 teams, including 25 of SU2C’s signature Dream Teams, multi-year awards to support collaboration between different SU2C researchers across teams, as well as 46 Innovative Research Grant recipients to individual early-career researchers. The work of SU2C is supported by its Scientific Partner, the prestigious American Association for Cancer Research (AACR). AACR supports management of many grants across the SU2C research portfolio.